This "March Madness Poker Night" event, hosted by Bernstein Wealth Management and Schomp, will include hosted poker, blackjack, and craps tables, food, drinks, and networking all while watching the March Madness games unfold. 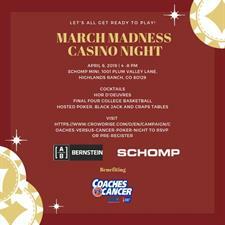 All proceeds will benefit Coaches vs. Cancer, which is part of the American Cancer Society. Their mission is to save lives, celebrate lives and lead the fight for a world without cancer. The fight isn’t over, and we need you on our team. Tickets are $250 each and you can register for the event by clicking the tickets link.